The talks between Vladimir Putin and Recep Tayyip Erdogan in Moscow on Monday were surprising with their unusual breadth of coverage and versatility of issues discussed. They discussed the development of cooperation in various areas - from economy and culture to military cooperation between the two countries. Ahead of his visit, the Turkish leader openly stated that he would discuss with his Russian counterpart the upcoming operation of the Turkish Armed Forces in Syria. Moscow’s interest in cooperation with Ankara is understandable. The Kremlin wants to develop the Turkish Stream project, and also to sell Russian weapons, and, to the extent possible, split the NATO. But what Ankara wants from Moscow is a much more complicated question. About why Turkey needs Syria, is it ready to withdraw from NATO, how serious is the talk that Erdogan intends to recreate some kind of Ottoman Empire, and also what is the role of the Kremlin in this, Rosbalt columnist spoke with the head of the Europe-Middle East Center under the Institute of Europe of the Russian Academy of Sciences, Aleksandr Shumilin. - At the end of the XIX century, the Ottoman Empire was called "the sick man of Europe". Today, on the one hand, we see a large-scale agenda for the current Russian-Turkish talks. On the other hand, Ankara’s participation in NATO exercises in the Black Sea. On the third, - it is pursuing own interests in Syria, it conflicts with the interests of NATO. So, against the background of all these contradictions, is it possible to rephrase that the old expression and say that Turkey today is a “sick man of NATO”? - I think yes. Turkey is really taking similar actions now, and not only in the Middle East. 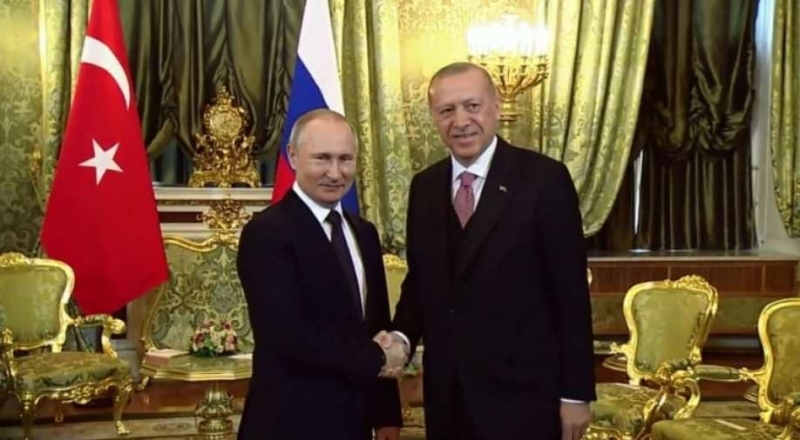 - And can we, against the background of such large-scale Russian-Turkish negotiations in Moscow, assume that it is a question of Turkey’s withdrawal from NATO and the creation of its military-political alliance with Russia? - A serious question over which many today are puzzled... In terms of the realism of such a prospect, the answer, of course, is no. But if we sum up various factors, then this cannot be ruled out as fantasy. At the same time, some time ago I talked with Erdogan’s assistant in international affairs and, in particular, talked with him on this issue. They talked, for example, about how a deal for Turkey to buy Russian S-400 systems will affect its relations with NATO. So his answer was quite decisive. He made it clear that Turkey will not be able to withdraw from NATO. At the same time, he was optimistic about the acquisition of the S-400 by his country and believes that this deal will not work against ties between Ankara and the North Atlantic alliance. Although, as shown by the events of the last month, it is this deal that is working to distance Turkey from NATO. Recently, the Americans have made statements that if the Turkish government does not revise these contracts with Russia, then the question of Ankara’s membership in the Alliance may indeed be raised. - That is, Turkey can simply be asked out of NATO? - Judging by Western sources, there is a tension between the Turkish representatives in the Alliance and all the others. But it is a question to what stage of this tension Erdogan can reach. My prediction is that he will not dare to withdraw from NATO and after some time he will begin to alleviate this tension. - For several basic reasons. First, the dominant political influence of Erdogan in Turkey itself is now declining, and the latest municipal elections have shown this. Second, his opponents have become strong domestically, who, as a rule, are pro Euro-Atlantic. And this despite the purge, which he conducted after the failed putsch. Therefore, he will not take such a decisive step as departure from NATO. It is not in his interest, because there is practically no alternative. - Does the alliance with Russia not look to him such an alternative? - This is a fragile and inadequate alternative for Turkey and for its traditional position between Europe and the Middle East. In addition, Erdogan had a lot of advantages, as a conductor of certain NATO projects in the Middle East. To break with this, to be isolated in a region where NATO is present impressively enough, he (and if not to him, then otherwise than to the thinking representatives of the Turkish establishment) is not strategically advantageous at all. The Turkish establishment, even after the purge carried out by Erdogan, still thinks of itself in the course of interaction with Europe. If we remove the NATO component, then Turkey finds itself in the region in isolation. - Turkey cannot become a serious partner of Iran simply by the nature of things. Not to mention the fact that it is simply not profitable. As is known, Iran is now in isolation. Turkey cannot also make long-lasting agreements with Syrian President Bashar Assad. In general, Turkey without NATO is a completely different Turkey, much less influential, both politically and militarily. You see, Turkey is a stranger in the Middle East. It and the Arabs are not in fraternal relations, and with the Iranians. Hence, its views are directed to Europe. The European vector in its politics has always been preserved, adding political and military weight to it. - Why does Erdogan need Syria? Is this the confirmation he wants to revive a new Ottoman Empire? - No, the question is much simpler. In Syria, for Turkey, the main thing is to prevent the creation of any autonomy and other proto-state structures of Kurds on its borders. This is the most important task for Ankara. - As far as I understand, Putin is ready to give Erdogan a carte blanche for this in the north of Syria? - To a greater extent than Western partners. For Europeans and Americans, it is unacceptable to allow Erdogan to crush the Kurds. This is primarily the position of the Europeans. Trump would be willing to close his eyes to these things, but the Europeans, first of all, as bearers of values shamed him for this and he is now modifying his position on the Kurds. For Russia, there are no restrictions on this issue.